Even though IT outsourcing nowadays is a common way of doing business it remains a complex task. Far too many things can go wrong at each step. It is a powerful tool, sometimes it’s the only tool you have at your disposal, the only tool that can give you desired savings, attract necessary skills, or close a large backlog of maintenance issues. Unfortunately, outsourcing is also a v ery complex tool that requires a lot of knowledge to operate. And thus far too often outsourcing projects fail to deliver promised savings. To change odds in your favor you need knowledge and to reading books about outsourcing is one of the sure ways of gaining that knowledge. I read a large number of books about outsourcing, some of these books offer general approach to offshoring various activities, some concentrate on how to outsource software development, some offer insight on how to outsource your life. At the same time I could not find a simple down-to-earth outsourcing guide. A book that would take me through entire lifecycle of outsourcing from initial step – making the decision on whether to outsource, through vendor selection, negotiating a contract, managing distributed engagement, monitoring and metrics, all the way to termination of hopefully successful engagement. That’s why I decided to write the book myself. “Outsource It! 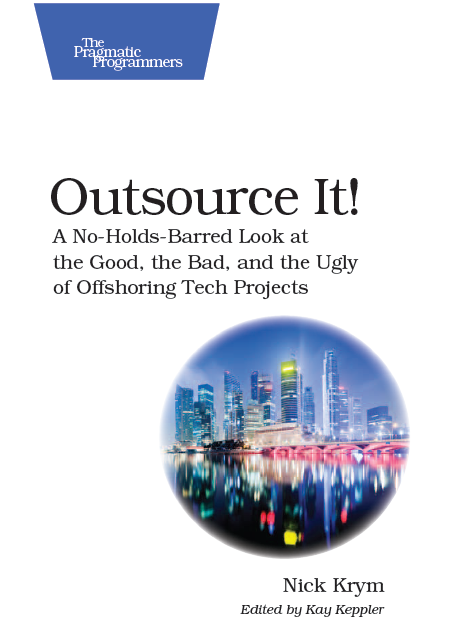 A No-Holds-Barred Look at the Good, the Bad, and the Ugly of Offshoring Tech Projects” is a step by step outsourcing guide. While most of the topics covered here apply to almost any outsourcing situation, this book is written primarily for technology professionals; it specifically caters to those working in small to medium-size companies or in the technology trenches of large organizations. What—and How Much— Should You Outsource?